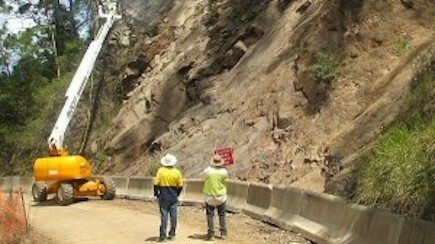 Several landslides impacting Bulga Road were recently remediated. The road is situated in steep terrain northwest of Taree and provides access to the Bulga Plateau, including Elands and popular tourist destinations such as Ellenborough Falls. Regional Geotechnical Solutions undertook geotechnical investigation works and provided design and construction advice for a range of remedial measures including gabion wall and drainage works to stabilise road formations, as well as rockbolt and mesh support unstable rock cuttings.